The Show House 2005 gold guest bedroom. 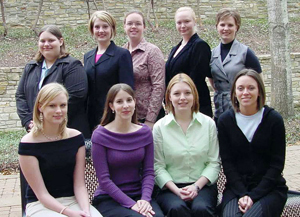 Sam Houston State University senior interior design students set out to achieve "high style and fabulous function" in this year's Designer Show House 2005 projects in Conroe. Visitors will have the opportunity to decide how well they achieved those goals through May 8. Tour times are Monday through Saturday 10 a.m. to 5 p.m. and Sunday 1-4 p.m. Tickets are $10 and proceeds benefit the Montgomery County Performing Arts Society. 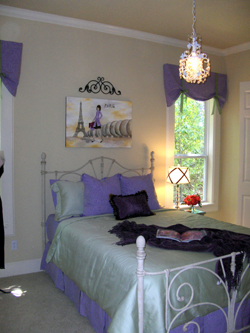 This year the SHSU students were invited to decorate two bedrooms--a guest and a girl's bedroom. Laura Burleson, assistant professor in the interior design program in the Department of Family and Consumer Sciences, directed the guest bedroom project. Guest bedroom project team members were, front row from left, Vivian Stauss, Amy Godwin, Nubia Heinz, Candi Wright Warren and Kristin Cady. 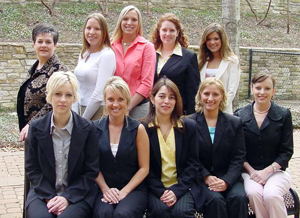 Back row from left, Laura Burleson, Morgan Bryant, Afton Williams, Jennifer Williams and Amanda Gillum. The students assisted in the selection and the overall design of the space and the facilitators supported the students with guidance and design decisions. As participants, the large group of 17 was divided into smaller groups that made recommendations for individual items in the spaces. All the students were on hand for installing the items they helped select. "The allure of the gold guest room is seen in a unique blend of French toile and classical architectural images," said Burleson. "The tranquil atmosphere allows guests to seclude themselves in the bedroom created by comfortable plush bedding, warm gold tones and amber accents. "The traditional feel of the furniture is balanced by whimsical accents seen in crystal beading along the edge of classical scarf valances that enhance the draperies. 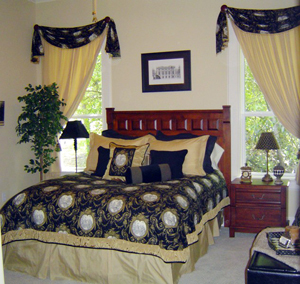 The mix of soft gold and black in the fabrics enhances the elegance of French sophistication." Brock said that the girl's bedroom "would inspire any young mademoiselle interested in Parisian fashions. "The bedroom incorporates traditional furniture with a variety of delicate French accessories to achieve a distinctive youthful elegance. The commissioned artwork details the youthful exuberance of a young woman experiencing the Paris couture. "Soft sophisticated lilac is complimented with feminine touches of sage meadow to allow the space to transition a girl to a young lady. In addition, the life size body form enables the young designer to explore her emerging fashion creativity. All of these special touches give the room a distinctive ambience which would give any girl a chance to fulfill her adolescent dreams." Key furniture and accessories for both rooms were obtained from Ward Furniture and Flooring, Fabric Carousel, Mount Vernon Gifts, Hancock Fabrics, Tuesday Morning, Joanne Fabrics, Linen and Things, Bed Bath and Beyond and Stein Mart. Bonnie Scasta provided the commissioned artwork seen in the girl's bedroom. Burleson was responsible for sewing of the duvet and draperies in the gold guest room, while Brock and the students created textile treatments for the girl's bedroom. Girl’s bedroom team designers were, front row from left, Mary Johnson, Stephanie Durrett, Jennifer Henske, and Lauren Van Dyke. Back row from left, Traci Kiros, Paige Haynes, Amanda Neill, Annie Norberg, and Shelby Brock. Corkey Shaw Custom Homes (4840 West Fork Drive) and Philip Lane Homes (4842 West Fork Drive) built the two houses used. To get to the houses, take I-45 south to Hwy 105 West, travel approximately one mile west of the Loop 336 where SH 105 intersects with FM 3083, turn left on West Fork Drive, follow West Fork Drive as it curves through the subdivision and the show houses will be on the left. This is the sixth year for SHSU interior design students to participate in the Conroe Designer Show House event.